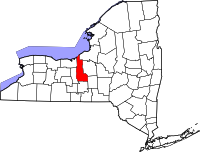 Cayuga County was founded in 1799 from land that was originally included in Albany County. That was not much of a distinction, however, since Albany County comprised all of northern New York State, all of Vermont, and unofficially continued west to the Pacific Ocean. The town of Auburn is the Cayuga County seat and is home to the County Clerk's office. The office is on the 1st Floor of the County Office Building at 160 Genesee Street, and the Clerk is the local custodian of a large variety of records, including all court records with the exception of criminal cases, marriages, property and deeds records, and many others. The Clerk's office also works in conjunction with the Cayuga County Records Management Division which also has a huge number of records on file, including naturalization records dating from 1799 to 1952 (also provided online), property deeds from 1794 to the present, as well as a great many more.